Our kitchen is a noisy environment and is not always conducive to having a nice, quiet phone conversation so we’ve moved our customer service line to a much quieter location that will enable us to better serve you via telephone. By having a dedicated customer service line, we will be able to answer questions and in every way, better serve you. 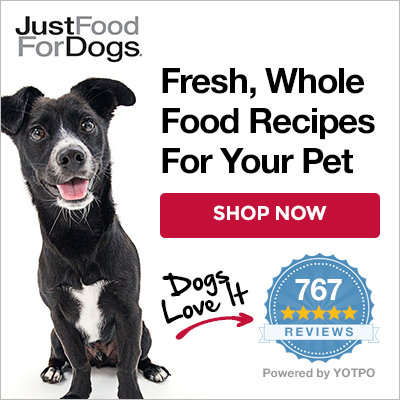 While everyone at JustFoodForDogs has their own email address and you’re welcome to contact any of us at anytime, we have also set up a couple of addresses to facilitate processing your orders and respond to general inquiries. We publish a monthly newsletter that has all the latest news including new product offerings and specials, events, and all the latest happenings that are fit to print at JFFD. We also publish our weekly cooking schedule every Thursday so you can plan your week if you like to purchase our food right off the stovetop. The next best thing to visiting us at the kitchen is to visit us on Facebook. Our goal with Facebook is to bring the in-store experience to the web so we post pictures of our four-legged friends who visit, as well as our cooking schedules, canine nutrition news and all the latest up-to the minute goings-on. So if you’re so inclined, join in the fun and and if you like what you see… please like us (we’re happy to say that a lot of people do). While barking is preferred, we tweet too :) In particular, it’s a great way to get the latest updates on what’s cooking at JFFD and other short little news bites. To find out the latest on what people think about us please seek us out on yelp. It seems that a lot of our customers like to post on Pinterest.com so we do too! It’s a good thing we’re not shy because we like to post on instagram too! We constantly get requests for our printed materials so we’ve made them available for download here on our site. Visit our downloads page and grab a copy of whatever you like. 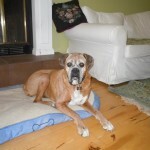 Maggie was diagnosed with chronic pancreatitis on top of chronic kidney disease. The diet for each disease contradicts the other, but JFFD worked with us to create a custom recipe and supplement to balance everything perfectly for her. Everyone who sees Maggie now can't believe it's the same dog. Not only is she thriving, but she is 3 1/2 mos seizure free without meds.